The USA’s World Cup squad will share a bonus pot of more than $20m (£13.8m) if they defy the odds to win the tournament in South Africa this summer. The potential payout is the most lucrative confirmed bonus scheme in the history of the tournament and could net the 23 players involved $895,000 (£617,332) each should they triumph. The cash on offer dwarfs the incentives being offered to players from other leading nations. The World Cup favourites Spain will reportedly earn “only” £500,000 each if Fernando Torres, Cesc Fabregas and team-mates win, while the Brazilian team would net around £250,000 per man for landing their nation a sixth World Cup victory. The German FA is understood to have agreed a bonus pot worth around £212,000 per man for victory, with lesser amounts for reaching different stages. England’s bonus payments are a closely guarded secret, and an FA spokesman would not comment on details but is it thought Fabio Capello’s players would earn bonuses of around £400,000 to £500,000 each for winning the Cup. England and the USA are in the same section for the opening phase of the World Cup and meet in the opening fixture in Group C on 12 June in Rustenburg. The USA’s massive bonus deal has been agreed in secret as part of the most recent Collective Bargaining Agreement (CBA). The CBA dictates pay levels and working conditions applicable in Major League Soccer and for the USA international team. Crucial to the deal was the Washington-based attorney, Mark Levinstein, a trial lawyer with a rich background in sports law who has worked on the behalf of American players for years. The breakdown in payments is set out in the graphic below. The plan allows for all eventualities from the USA being knocked out in the group stage without winning a point, to lifting the trophy in Johannesburg on 11 July. If the USA don’t gain a single point, each player will still pick up $78,447 (£54,102) in agreed bonus money from the US Soccer Federation. This will come from a pot of $1.5m set aside by US Soccer for qualifying for the finals, plus an appearance fee of $4,410 per man per game in South Africa, regardless of whether they actually play. Collectively the squad will receive an extra $180,000 per point won in the group stage, to a maximum of $1.6m for nine points for games against England, Slovenia and Algeria. Qualifying from the group will trigger an extra squad payment of $2.85m. Reaching the quarter-finals will earn $3.4m more. Reaching the semi-finals will be worth another $2.7m. Winning the semi-final then losing the final will be worth another $6.9m, while winning the semi-final and final will earn the squad pot another $7.8m. A pot of appearance money set aside by US Soccer is worth a maximum of $710,010, or $4,410 per man for up to seven games. That makes the total potential bonus pot $20.6m, or $895,131 per man. The USA, ranked No14 in the world, are the 11th highest ranked team at the event because higher-ranked teams from Croatia, Russia and Egypt failed to qualify. The USA are generally considered by bookmakers to be joint-12th favourites (of 32 nations) to win the trophy. The USA’s best performance to date was reaching the quarter-finals at the 2002 event, when they lost narrowly, 1-0, to Germany, the eventual runners-up. The background to the bonus deal is explored in a new book*, ‘Star Spangled Soccer’, by a sports business consultant, US-based Englishman Gary Hopkins, who has spent 20 years working in the American soccer market. He also explores the rationale of the massive bonus payments for 2010, essentially that the US Soccer federation has decided to hand the majority of any financial rewards to the players. Hopkins also looks at how this culture of “winner takes all” is always good for the federation, but not necessarily for US-based players who, in general, make relatively tiny sums as professionals compared to counterparts in most of the major European leagues. Fifa’s prize fund for competing nations is paid directly to national governing bodies, who then decide how to split it up, or indeed whether to split it up or keep it for themselves and for re-investment back into football in their countries. The World Cup winners will earn $31m (£21.4m) from Fifa in prize money, while the runners-up will win $24m (£16.6m), and so on down to at least $8m (£5.5m) per nation for getting no further than the group stage. 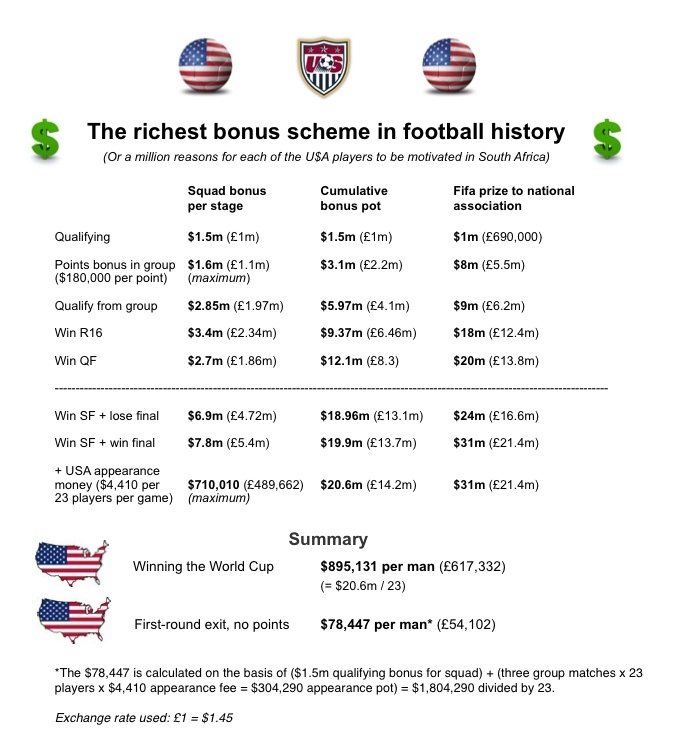 If the USA win the World Cup, then US Soccer is committed to putting as much as 66.4 per cent of the prize earnings ($20.6m of $31m) straight into the players’ pockets. If the players flop, they will get just 20 per cent of US Soccer’s earnings, or $1.8m from $9m. (In addition to the $8m minimum for being in the group phase, each nation gets $1m “preparation” money). * Star Spangled Soccer: The Selling, Marketing and Management of Soccer in the USA, by Gary Hopkins, is published by Palgrave Macmillan and is available now in the UK, price £12.50 at amazon.co.uk, and will be published in the USA on 8 June. Hopkins is a member of the Advisory Board for Warwick Business School’s Centre for Management in Sport at the University of Warwick, England.